This is how the world should be, there shouldn’t be corporations holding everything in their hands, and there should be Indie developers with fresh ideas that will make your blood rush to your brain to tell you that You NEED to play this game. Why such an intro? Well, when you see the 2 minutes intro for the new HAWKEN all you are going to wish is to play that game, immediately. Now, the game may be free of charge or it may come as a $50 Christmas gift, but you won’t care cause all you want is to play that game, that’s how this game looks like-Awesome. So, as the trailer starts you will see the world in the far future, over-industrialized and not so cute as it is now (yes, its cute now compared to what you have in the game). Once you finish the trailer, please have in mind that Adhesive Gaming published a beta game couple of weeks ago so you can go and start playing the game in the couple of minutes. It takes a good internet connection, Email, Password and your profile name as it will be in the game. 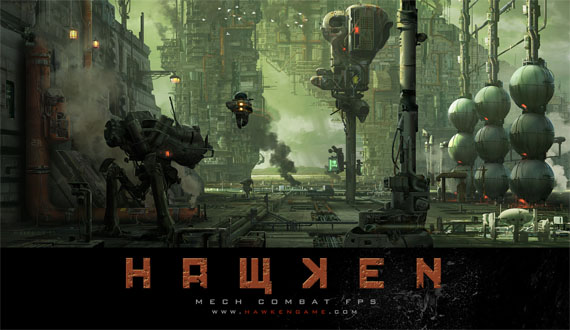 Once you downloaded the game you can enter the mechanical world of Hawken. It will take you some time to figure out what you have to do, but once you’re used to all the controls and surroundings, you will have hundreds of hours of pure fun. Oh yes, it’s 2 GB download once you decide to enter the game so it may take some time before you actually start playing, but it’s worth it. The game is something like BF 2142 meeting Star Wars meeting CoD but with a huge twist. This twist is you sitting in a robot and chasing your enemies. You can customize your robots and once you do that, you can join your friends in an online shooter. The mechs have extra trust in their engines which can make them jump like crickets. This brings even more speed to the game and the planet, even being dead, will bring the liveliest battle out there. You will chase your enemies through the Illal (the World where everything is happening) and the enemies will chase you. The stunning graphics are powered by Unreal Engine 3 which is a symbol of HQ graphics. As you progress through the game, you will unlock several bonuses for your mech which will bring the unique experience. No mech is the same and this is what will make you feel unique while you’re fighting your way through the game. The game itself is a bit of arcade style, if not totally arcade. It is constant shooting and chasing, you shoot your way through the field (city) and there is nothing more to it, which is great. This is what the arcade games are all about. To have loads of fun and not to waste any second of your precious time. On the other side, you may not feel like you’re inside the robot since it feels like everything is going smooth and without too much trouble. What I am trying to say is that robots should be harder to control, well that’s my opinion. Author Bio: Jason Phillips wrote this article. He is a freelance writer who has amazingly written for many websites. He recently wrote for a website which was related to technology and video games.